This set of playing cards was recently donated to our archive by a member of the public. 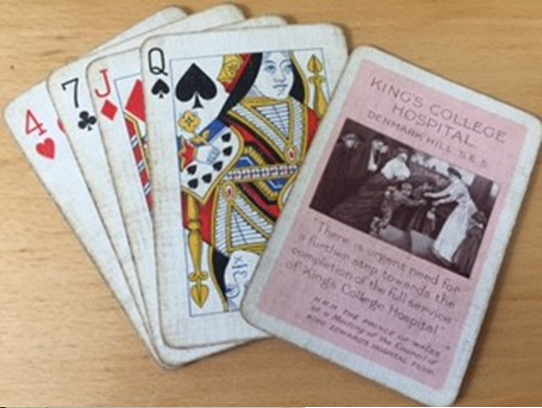 Little is known about the origin of the cards but it is likely that they were created as part of a campaign to raise money to fund the relocation of King’s College Hospital from The Strand to Denmark Hill in Camberwell. The move had been driven by The King’s Fund which had identified a concentration of hospital provision in and around Westminster and north of the River Thames but very little provision in south London despite a rapidly growing, mainly working class, population. The image used is of the Prince of Wales, so we can date the cards to having been produced between 1897 and 1902 (when the Prince became King Edward VII).